Hey my dude what do you think? 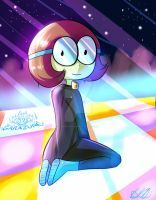 Kawaii Young Enid as a Love Zombie is adorable! Bueno pero no importa que sea predecible! I think I broke my "Squueeeeeee!!!!" meter when I saw this. Enid-Z is adorable. And these two should definitely try dating again.